Antonin Guillot. 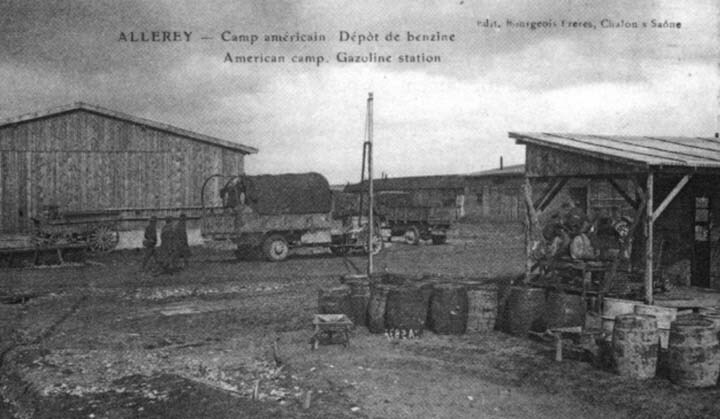 Le Camp Américain d'Allerey (1918-1919). 1999. Organisation and camp life: Installations et équipements. As per orders from the High Command, American hospital centers were constructed according to standard plans. They were divided into identical quadralinear sections of variable number according to their size. The outlay of the Hospital Center comprised 13 sections and a separate cemetery (see diagram above) ; 10 of the sections, in two groups of five, functioned in principle as a base hospital, all built according to a uniform plan. The other section comprised the HQ bildings and motor pool; another, built apart from the rest, housed a psychiatric unit. A convalescent camp, making up a 13th section annex, was to located to the north of the camp. The camp was crossed by a two-tracked railway line, connected at the hamlet of Chauvort to the PLM line from Chalon to Gray . This facilitated the unloading of the sick and wounded, as well as food supplies. The roads which paralleled the track comprised a large avenue (7) which facilitated the circulation of ambulances and trucks. From each section of this central avenue---the camp's backbone--- two secondary roads split off to service the base hospitals, while being linked among themselves by various crossroads. There were also roads (8) along the back of the two groups of five base hospitals, placed symmetrically on either side of the railway line (see diagram). The buildings at the base hospital were type 1 barracks as described above (see chapter on construction of camp). Each hospital unit resembled its neighbor except for slight variations such as the placement of the latrines or the addition of a tent in the back in the areas of "emergency expansion." Section module for the Hospital Center at Allerey. The completed center numbered 620 buildings of various types. The tents, made in France, 5.2 m by 10.5m (17' X 34'), were of the Marquee type. Three tents joined end-to-end and put at the back of a ward, extended it. Two rows of beds, with a central passage, increased the capacity of a room by 50 beds (or slightly less in order to allow for the installation of stoves). It proved to be necessary to place boards under the beds in order to keep them from sinking through the tarred fabric which served as a floor. 36 tents were installed in each unit, increasing the capacity of the hospital section by 600 beds which, at certain times, were all occupied. The installing of tents at the back of one out of every two wards caused certain problems in the servicing the wards, but this procedure was adopted in order to decrease the risks of fire. At the eastern extremity of the camp, the section at the entrance of the railway connection (see diagram) housed HQ and automobile transportation, including the warehouse (120m by 15m), maintenance, cold storage, bakers, barracks for civilian workers, parking lot, garage, workshops, gas station, etc. The psychiatric section, to the west of the camp, faced the very wide central passageway beyond the end of the railway line. It consisted of lodgings, messhalls, kitchens, bathrooms and toilets for the soldiers and personnel This unit was never completed but was occupied by military police when the camp was at its high point of occupation. The convalescent camp was set up to the north of section numbers 7 and 8. It was composed of 20 buildings and 150 tents capable of housing 5000 men at a time. It was reached by roads which crossed section 7. It had a similar general layout to that of base hospitals with the difference that the hospital wards were replaced by tents (for 2000 patients) and the rest was suppressed, namely: nurses' quarters and outbuildings, reception rooms, laboratories, operating room, morgue, garage and store. The Americans had anticipated that it would take a rather long time before Germany capitulated. They calculated moreover that the effort and sacrifice to obtain this end would be considerable. That is why the hospital equipment in the rear had been designed with the perspective of difficult combat which would last for many a long month. But given the size of such establishments, their installation was plagued by problems. In Allerey, it took time to make available sufficient and efficient equipment. Throughout the whole existence of the Hospital Center, almost until its closing, there were frequent interruptions in the construction and functioning of certain services, in the production of electricity or the working of the water pumps. Delays in railway traffic, embargos, the lack of manpower in the depots---all lead to frequent delays in the reception of construction material and other supplies. Morever, in the inital plans, offices for headquarters had not been foreseen, no more than a post office or a few other services: although these were taken care of as quickly as possible. At first, the plans called for a high tension line between the camp and Chalon to provide lighting and energy, but the project was abandoned. Little by little, small 25 KW generating stations were set up, each feeding two of the ten sections of the Hospital Center. These stations did not function until the first patients arrived; number 1, located between sections 1 and 2 which it fed, entered service on June 26th. Heating in a treatment room (oculist and dentist). for the camp at Allerey. 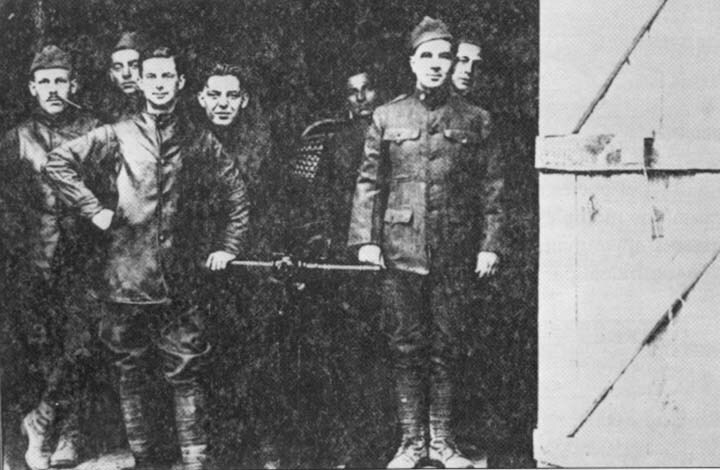 The others were put into action as soon as they were built; the sixth and last, in section 8, provided electricity for the first time on November 9, 1918. Until then, candles and lamps were used. As these generating stations were of small output and required permanent supervision, this method of obtaining electric energy was never satisfactory. When it was necessary to provide current to 12 sections of the hospital rather than 10, the system proved to be particularly defective; and when the patients arrived in the evening, as was often the case, the intensity of the current was not sufficient to properly light the reception points, wards and operating rooms, nor to operate the X-ray machines. This insufficiency had to be made up for by putting lamps in different parts of the Hospital Center and by making spare use of the current. With the prospect of the coming cold weather, stoves were requisitioned in July 1918. However, these did not arrive in sufficient number until after the first chills, at the end of October and beginning of November. By mid-December, there were finally enough to assign two to each common ward and one to each double tent. The Fire Marshall was responsible for their installation. There was always enough wood on hand, with a reserve, in anctipation of possible delivery delays, of several thousand tons. The wood was delived by barge to the port of Chauvort where it was stacked up in enormous piles before being brought to the camp by wagons; or it was cut in the neighboring forest by civilians. In a camp composed entirely of pine buildings and tents, the risk of fire were particularly great. This risk was able to be reduced by moving the base hospital units and the tents sufficiently far away one from another and by installing spark arrestors on all the chimneys or stove pipes. From the start, each unit was also provided with a minimum equipment: lances, barrels (45), pails, ladders and fire extinguishers. Finally, all units were equipped with extinguishers, 10 20-liter pumps and 200 meters of flexible hose. A central fire station was created as well, equiped with a tanker car containing 340 liters of carbon dioxide foam. This station was on call day and night with ten men commanded by an officer and NCO, and was given responsibility for keeping watch over the Hospital Center and insuring its overall the good condition. Later, by way of precaution, three more tankers were added and were placed in the convalescent camp, in section 5 and in the HQ section. Detailed instructions were posted in all wards, barracks, etc. and training sessions were organized. Despite all the precautions taken, there were numerous small fires of which around 90% were attributed to cigarette butts. Only one rather serious fire broke out due to the explosion of a gas tank. Lest the fire reach the bedridden patients or that even one building be lost, it was forbidden to smoke in the wards and barracks until the number of these patients had lessened noticeably. Those in charge of the Hospital Center could congratulate themselves on the efficiency of their fire prevention service and on not having had to deal with any significant degree of damage. Minimal fire prevention (pail and barrel). The water reservoir of 380 m3. This was provided by pumps driven by gasoline engines, bringing the water from three wells of an average depth of 17 meters, located in Chauvort at the place called "Les Corvées", not far from the Saône, near the railway connection leading to the camp. Another pump then sent the water under pressure through a main pipe, 20-cm wide, on into the water supply network feeding the different sections of the Hospital Center ; 10-cm pipes, provided with valves, were connected to the main pipe, each feeding a hospital unit, while the ultimate distribution throughout the buildings was provided by pipes of a width of from 1.9 to 5 cm. The excess was diverted to a stone-lined reservoir with a capacity of 380 cubic meters (380,000 liters), built on an elevated bit of ground outside and to the west of the camp, at the town's the highest elevation. Pump flow increased from 76,000 liters a day in August to 190,000 liters in December. A central water-purification center had been (badly) installed, and was not able to be used; so the water in all the hospital units was sterilized through the use of sacks of "Lyster" antiseptic, in order to prevent illnesses caused by possible contamination of the drinking water. The problems of hygiene were handled rather favorably, whether they concerned drainage, the elimination of garbage and sewage, disinfection, housing for patients and personnel, or epidemics. When the first base hospital arrived on June 20th, a certain number of leach fields had been dug and the terrain was therefore relatively well drained. Afterwards, a system of sewers was put in and drainage improved, although continuing to cause a few problems during the autumn rains. The sewers consisted of a main pipe of 30 cm diameter, with branches of 15 and 10 cm diameters, ending up in each hospital group at the reception wards, operating rooms, kitchens and laboratory. Liquid wastes were piped to a septic tank located 400 meters to the north of the Hospital Center, where they were chlorinated in accordance with French law. The clarified effluent was then evacuated by ditch to the Saône. Given the difficulty of procuring pipe, the installation of the sewage system was much delayed and the removal of liquid waste remained a serious problem for some parts of the camp. 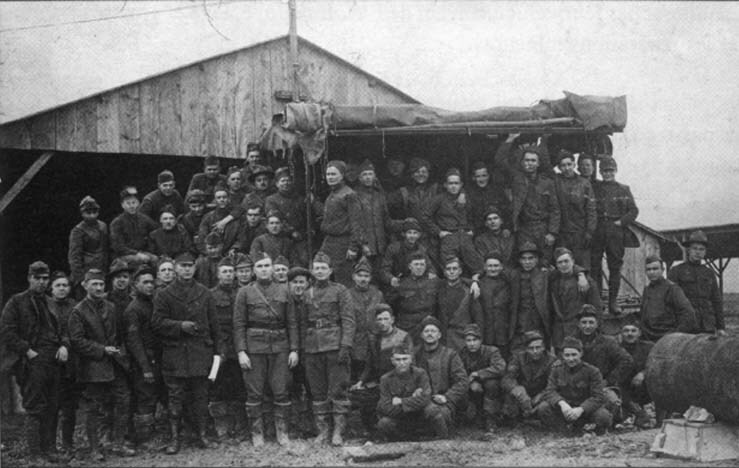 In the beginning, they were hauled away in barrels placed on a truck, then in a tanker-truck, and the excrements were transported in pails to be buried in trenches or poured into leach fields. Later, an incinerator was installed for the burning of the solid wastes from the latrines, the liquid going into the sewers. Garbage was destroyed in a an incinerator made of cement and brick. Food remains were sold under contract to M. Pierre Develle, who raised pigs in Palleau, a village near Allerey. Many of the patients arriving by sanitary trains were infected with parasites. They were immediately cleaned thoroughly and their clothes disinfected. 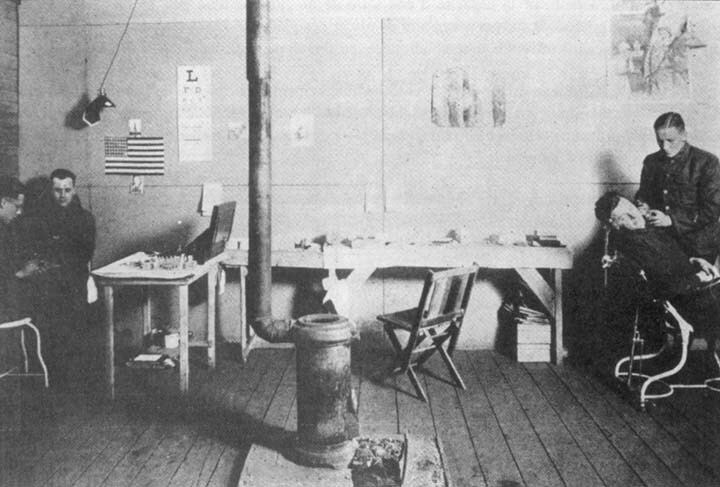 To avoid the spread of disease, especially during incoming waves of patients, beds were arranged head to foot and were separated by improvised curtains, while great care was taken to provide proper ventilation. Moreover, in shared wards, alcoves were installed, and in the services where respiratory and infectious diseases were treated, the patients and personnel wore masks----all of which proved to be efficient. Even with such measures, the beginnings of epidemics appeared. In August, a few isolated cases of meningitis were noted. At the end of September and beginning of October, patients arrived infected with the Spanish flu, but this alarming situation diminished in November. In October, a few cases of diphtheria were noted and this disease was present until the end of Decemberr, without reaching critical proportions. The epidemic was quashed thanks to a very strict quarantine, with appropriate isolation and treatment. Important documents, to or from the headquarters at Nevers and the surgeon-general's office in Tours, were in general delivered by courriers on horseback. At first, the postal service was put a little room in the building occupied by the Corps of Engineers HQ. Each day, the mail officer brought back the mail delivered to the Allerey post office. 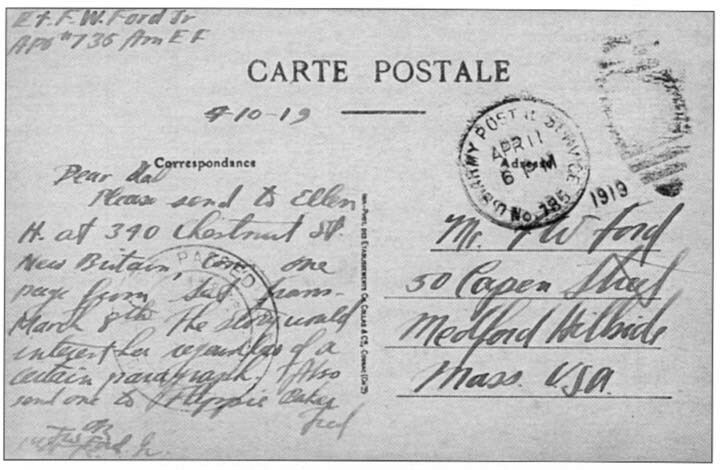 Postal activities at the Hospital Center began on July 6, 1918, but the office did not get it own postal sector number until August 25th: APO 785. The post office then occupied a special building until May 6, 1919. In September, a registered letter service was established grew rapidly, along with a money order service (which handled $20,000 in December). From November on, some 40 mailbags were received each day and 10,000 letters sent out. The use of a personnel roster thereupon accelerated mail distribution the success which contributed greatly (according to the military authorities) towards raising the morale of those concerned. Early on, the French telegraph line was the only one available to the Hospital Center. An interpreter from the Corps of Engineers Office used the telephone to receive and send the Center's messages by intermediary of the office at the Allerey train station. This service did not work very well, though. It was soon extended all the way to Dijon but communication still remained difficult. It was only when the Hospital Center was connected to American lines that liaison with the exterior was satisfactory. In November 1918, at the suggestion of the head officer of the Center, the Chalon branch of the Société Générale bank opened an office at the Allerey Hospital Center. 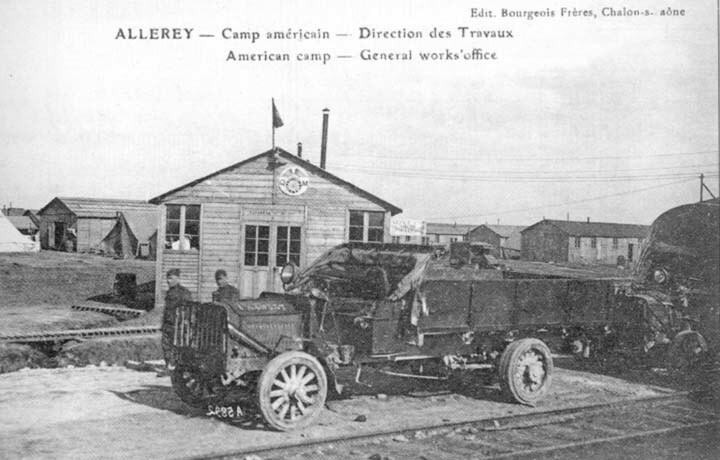 To transport between Allerey and Chalon in both directions, the military police furnished the guards while the motor pool provided the necessary vehicles. Open between 10 AM and 4 PM, Mondays, Wednesdays and Fridays, this bank proved to be very convenient. In addition to banking checks, it sold French war loan certificates. Certified letter from the Hospital Center at Allerey: A.P.O.1785 --- with censure stamp. From: Capt. George E. Shepherd, Allerey; To : Jacob Frères et Gabin, Navilly. Date : 20 December 1918.
to the U.S.A. on April 6, 1919. One of the Camp's greatest handicaps was a lack of means of transportation, whether steam- or motor-powered. Allerey was a small village and its railway equipment was inadequate for the scale of the new needs. Road transport was unadapted to the situation for several months. At the camp, there were few trucks and, the small number of ambulances, too light to be used for carrying certain loads, were not enough to bring supplies to the Hospital Center back from nearby markets, and it was often necessary to keep trucks and ambulances running, day and night. The automobile transportation service was in charge of the furnishing, maintenance and good functioning of all automotive vehicles assigned to the Center, as well as supply of replacement parts. It had to provide appropriate transportation for all the (base hospital) units. At first under the orders of the quartermaster corps, it became independent in July 1918. At firsts, there were no trucks available to serve the base hospitals and needs were met by occasionally borrowing construction work trucks, after 6 PM, in emergency cases. Little by little the motor pool grew but the situation improved considerably after the arrival of a truck company, with 72 men and adequate means of transportation. Truck and ambulance companies were created, but service was nonetheless hampered by the lack of replacement parts or gasoline. In urgent cases, it was necessary to send trucks--- which were not easily done without--- to Nevers or Dijon, in order to bring back necessary parts or fuel. The supply of 15,000 liters of gasoline per month allocated to the Hospital Center proved to be quite insufficient and needs rose rapidly until December. At that time, 30,000 liters of gas per month were needed to keep the rolling stock moving, along with electric generators and pumping stations. In November, the work bays were finally well equipped, a gas station had been installed and shortages ceased. Qualified mechanics had been found amongst the personnel of the Center services and in the Convalescent Camp and were reassigned to the Trucking Company. Of the 50 vehicles at the Center, only one or two could be found in the repair bay, despite intensive use. However, one of the main sources of problems was the progressive degradation of the roads, due to ever-increasing usage. This slowed down the flow of traffic and damaged the vehicles. As a consequence, it was required that drivers not leave their vehicles before having cleaned, washed and greased them, and having topped off the tanks and taken care of minor repairs. The Center's first three hospitals, which had been organized as Red Cross units, had not received the vehicles assigned to them in the United States, and had only the use of four Fords which were made available to the different (base hospital) units, each in its turn. The railway transportation officer was responsible for railroad transportation of personnel and supplies to and from Center. Supervision of the internal branchlines of the camp, however, were the responsibility of the Center's quartermaster. The railway transportation officer, upon being notified of the number of patients ready for departure and their place of assignment, sent a request to the Bureau of Troop Transportation in Tours, and then informed the evacuation officer of the date on which transportation was possible. His office, at the Allerey train station, was connected to the Hospital Center by telephone and was open day and night. It was informed by long distance telephone of the arrival time of trains to pick up the outgoing soldiers who were thus alerted in due time so that they would be ready and not be subjected to long waits. This officer also had to locate lost freight, alert Center headquarters of the arrival time of hospital trains, organize the movement of the shuttle car to or from Dijon (see "Quartermaster services", below) and maintain liaison with the 4th bureau of the French War Ministry. The Quartermaster had charge of a number of important services. The "Subsistence" Section was responsible for everything associated with food products. For several weeks after the arrival of the first hospital, bread and fresh meat were brought by truck from Dijon, but as soon as patients arrived in great numbers, transportation by truck proved inadequate and a train car shuttle was put into service, escorted by troops. This new shuttle functioned for about six months, up until a bakery was installed at the Hospital Center and fresh meat was brought directly from the warehouses. The shuttle then was used to transport dirty laundry to a civilian cleaning establishment in Dijon. Other food supplies arrived automatically, being sent from base stores and distributed by the Center's Quartermaster officer to the various quartermaster stations. Such a mode of deliveries required around 10 railway wagons per day, but at a certain period (November-December 1918), while the Center was functioning full force and around 23,000 rations were needed daily, no less than 27 wagons arrived each day. In order to deal with mounting needs, a buying agent was named for the Center. He combined the orders from the different base hospitals while buying fresh vegetables, eggs, milk which the warehouses could not supply. This system was necessary to prevent overcharging of the base hospitals by local markets, to save money through wholesale buying, to organize purchases in function of need, and finally to extend the buying areas beyond the area accessible to the hospital units. These products were often bought at far-away markets, such as potatoes in Brittany or eggs from Algiers. In order to avoid the overfilling of the Center's warehouse and with a view towards meeting needs which might arise from an unexpected development of the Hospital Center, the chief officers of the various units were required to fill their storage space to the maximum with non-perishable edible products, thus constituting a two month reserve. 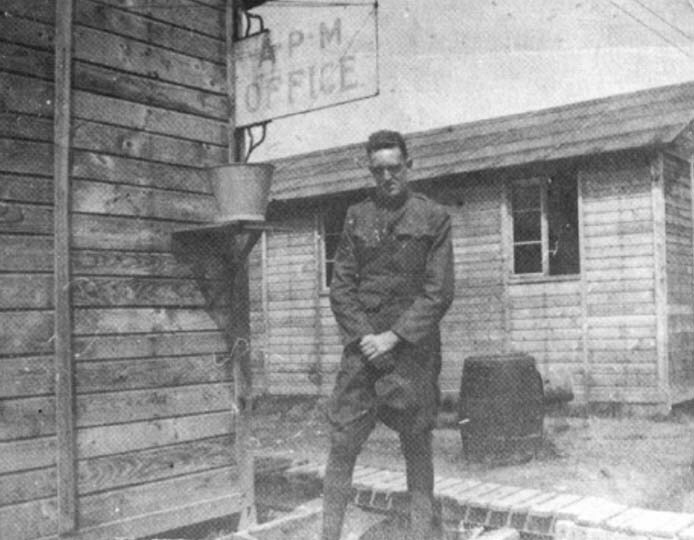 These measures proved to be very useful when the Center experienced a rapid growth in October 1918, as neither the state of the roads nor the available means of transportation at that time would have made it possible for the quartermaster service to meet their needs. The bakery (the seven ovens, the bread, the personnel). When fresh meat first arrived in great quantity, it was put in a cold storage room installed in the warehouse and constructed in accordance with Quartermaster food supply service requirements. This cold storage room was simply a box, 6 meters by 6 meters and 3.6 meters high, with 30 cm thick walls and ceiling. The walls were filled with compacted sawdust and outfitted with a door which could be sealed. The frozen meat quickly brought the temperature of this room down to a level making it possible to maintain a reserve of one week without ice. Later, an icebox was constructed producing a ton of ice a day and, along with it, a cold storage room which could hold around 50 tons of meat, fresh vegetables, etc. In August, a military bakery was installed by Bakery Company n° 357 and grew progressively until it had four ovens. From October, it furnished 12,000 kilograms of bread per day and maintained this output for several months. This was possible thanks to day and night shifts, but nonetheless, was not enough to fully meet the Center's needs at the high point of its occupancy, so it had to be supplemented by several shipments from the military bakery at Dijon. The personnel of Butchery Company n° 331 assigned to the Hospital Center were distributed amongst the various base hospitals, and instructing the cooks on how to care for and cut up the meat. After the Hospital Center was organized, a retail store was quickly opened, but it was soon seen that this would not be able to meet all the demands: many patients were unable to get there and the personnel did not have the time. The members of the American Red Cross from various units bought the most asked-for articles (tobacco, sweets, etc.) to the limit of their abilities to stock it, and sold them at cost to the patients (enlisted or non-coms) or to the service personnel. The mess officers took responsibility for the sale of articles to the officers and nurses. This section disbursed all funds, except those allocated by the surgeon general to the head officers of the various units. The base hospital quartermaster officers distributed the monthly pay to the patients and personnel of each unit. The total came to around $500,000 a month, although for serveral months this amount exceeded that by 20% . This service had to deal with serious problems throughout the existence of the Hospital Center. Some of the wash was farmed out under contract to Dijon, 55 kilometers from the Center. The laundry was sent out and brought back by trucks, and later by shuttle train. 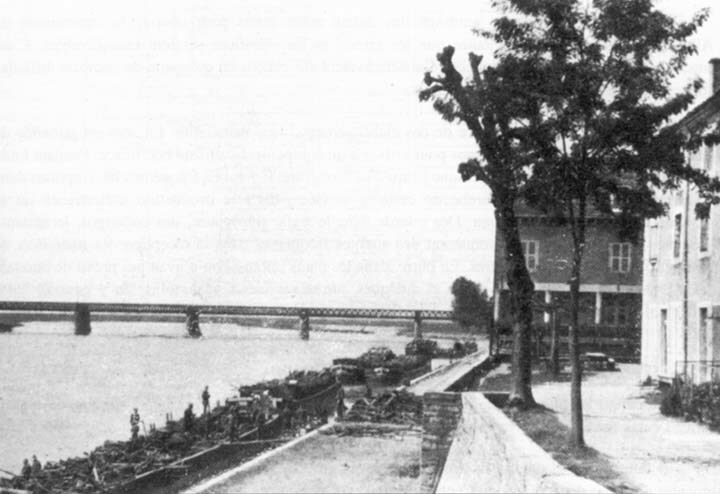 But Dijon's resources proved rapidly to be inadequate, and so much so that a "hand cleaning" establishment (a wash-house) was installed at Verdun-sur-le-Doubs, 4 kilometers from the Center: a wash-house-boat was rented, thirty washerwomen were hired and fifteen large washing machines were installed. Following that, two mobile washeries were brought in, functioning day and night. The output of these installations was of the order of 200,000 pieces of wash per month. In September 1918, several loads of hospital laundry were transporetd by truck to the mobile washeries of Beaune, when circumstances made it possible for them to deliver this service. In October, this steam-washery at Beaune, intended to serve both the Beaune and Allerey Centers at the same time, went into operation and, as soon as it was able to satisfy the needs of the two Centers, it did only that. The washery ran with day and night shifts, but its output never reached that of Mesves (in the Nièvre region) which had been designed to handle 279 tons of wash per month. The greatest number of laundry items washed by the Allerey Center during a month was 300,000 in December 1918. During the most busy period, the civilian employees of the various base hospitals washed the laundry of the operating rooms,--- but despite their efforts and the use of all available resources, there were never less than 100,00 pieces of laundry waiting to be washed. 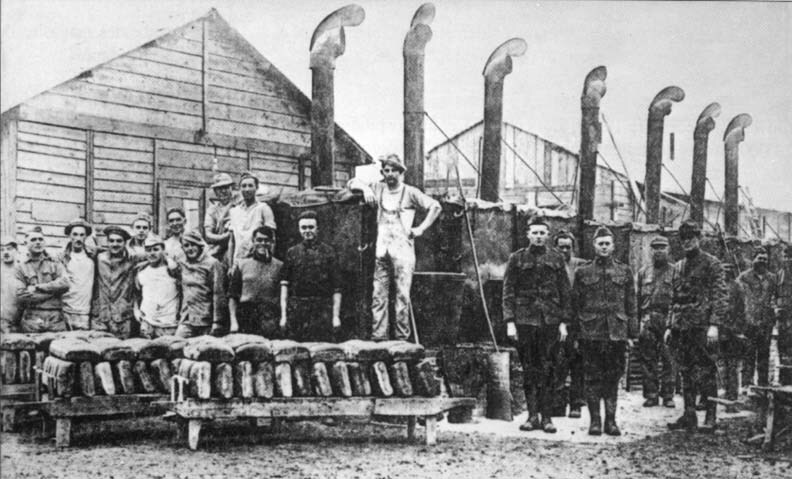 The materials section of the quartermaster service supplied firewood, fodder, fuel, clothing, equipment, arms, etc. Wood and fodder were bought locally, coal came by the river ports, other items came from warehouses. It was necessary to have a great quantity of clothes and equipment in reserve, given the rapid turnover of patients, whose average stay at the Allerey Center was but 17 days, and who were required to leave with a complete set of clothing and equipment. At a certain point, there was stock enough for 40,000 men, of a value of a million dollars. Given that there were no buildings vast enough to store such quantities, the largest items were stored under tarpaulins, on top of especially-constructed platforms. 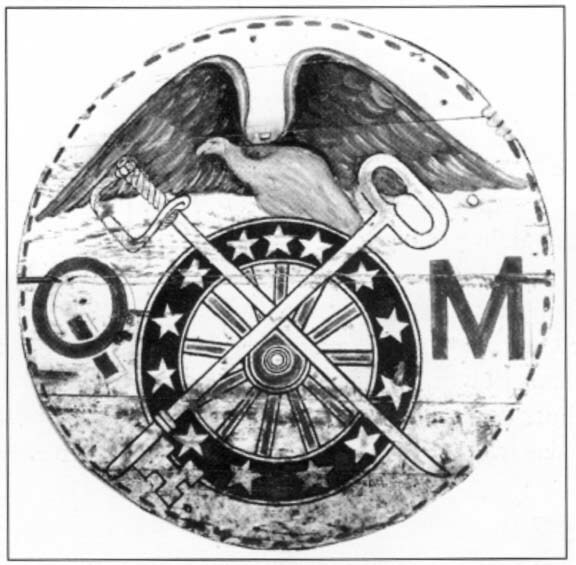 During the construction of the Center by the Corps of Engineers, the quartermaster was responsible for and was in charge of the carpenters, plumbers, electricians, shoemakers, etc. Maintenance was in principle the responsibility of the quartermaster officers of each unit, but the quartermaster general directed this service for the entire Center and took care of matters requiring considerabler resources or a technical competency which the hospital units did not themselves possess. Animal-drawn transportation never amounted to much at Allerey, but several harnessed wagons were maintained almost until the closure of the camp, particularly for serving those hospital units which could not be reached by truck. After the creation of a motor-pool, the only other mode of transportation were shuttle cars and those which circulated on the branch lines inside the Center. These last were loaded at the warehouse and then pulled by trucks being driven on the road alonside the track----which made it possible to make more deliveries than with a single truck and freed up many vehicles for light weight transportation (see engraving below, page 44). The Center's reclamation service was under the direction of the quartermaster general, but in practice, reclamation was taken care of by the various camp units whose collections were combined by the general service. Certain items were the object of particular attention: fats, cloth wrapping, paper, tin cans, bottles, bones, rubber and wire. The collected fats were clarified through boiling and filtering before being sent out; cloth and paper were gathered in balls; a few complete loads of tin cans were sent to reclamation centers; bottles were sent out to be used again or sent to a depot; nails, wire, rubber and bones were sent to other depots. Recycling operations concerned many other articles, but all those which could be used otherwise, or fixed, were kept to be repaired or cleaned and given to the appropriate services. Recycling was associated with efforts to minimize waste ---of edible products as well as other such items as clothing. A certain profit was made from the sale of food wastes to entrepreneurs who picked up the garbage (see above: "Sanitary arrangements"). In addition , the quartermaster general commanded a work battalion assigned to the Center, companies of bakers and butchers, the detachment of the mobile laundry, civilian employees and other workers in this department. This task was carried out with difficulty, given the decentralization of this personnel, and could be carried out only by convalescing officers given the duty of supervising the largest of the work groups. A smaller but permanent group took care of the unloading of the traincars and notified the railway officer of their return. The quartermaster general also was responsible for the Hospital Center's cemetery (A.E.F. Cemetery n° 84), for its materials and for the upkeep of grave registration (see chapter "the cemetery").